This is simplicity at it’s best! 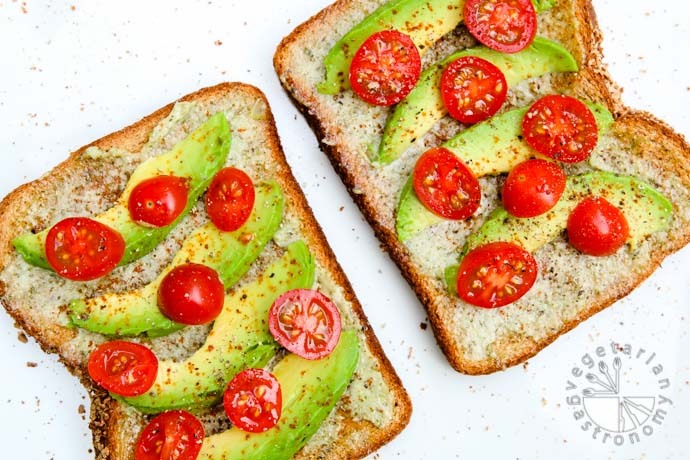 and there you have it – simple, easy to make, and glorious in flavor – Avocado Cherry Tomato Toast! I stumbled upon this creation when trying to come up with a quick, satisfying, healthy, and filling lunch for myself on those days where I don’t have the time to make myself something more elaborate or don’t have leftovers from the night before. For those of you who follow me on my Facebook Page, you know that I was on a ‘veggie wrap kick’ for awhile using my Green Lentil Hummus, fresh veggies, avocado, and crunched up baked healthy sweet potato chips for texture. But this time I was in the mood for something else, and I really wanted to use my freshly made Sriracha Salt. 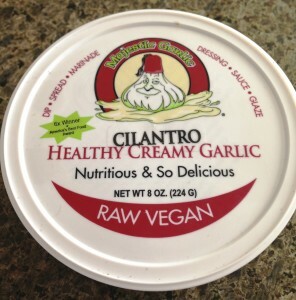 As I was gazing through my fridge, my eyes caught the Cilantro Creamy Garlic Spread from Raw Vegan that I had purchased from my local Jimbos Grocery Store and the delicious cherry tomatoes I always keep on hand for my son. I immediately toasted some bread, and minutes later found myself devouring this flavor filled Avocado Toast. I would definitely call it my new lunch-time addiction! 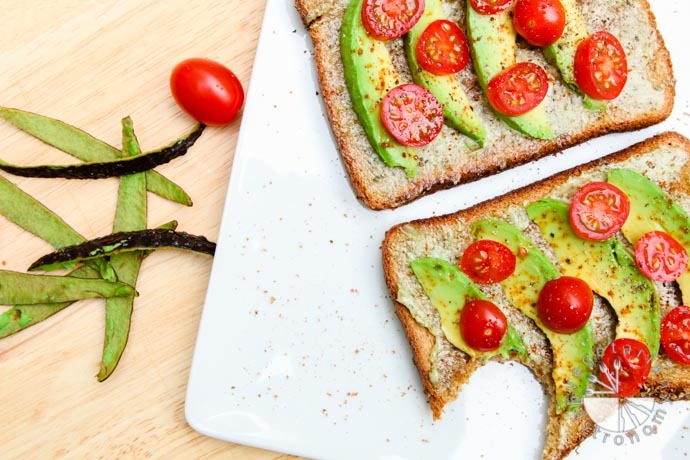 Be on the look-out for other variations of Avocado Toast recipes on the blog in the near future. If you don’t have Sriracha Salt already made in your fridge (which I highly recommend), you can easily substitute sea salt. If you want that extra spicy kick, feel free to top it off with red pepper flakes or a few drops of Sriracha Sauce. What is your favorite quick go-to lunch? 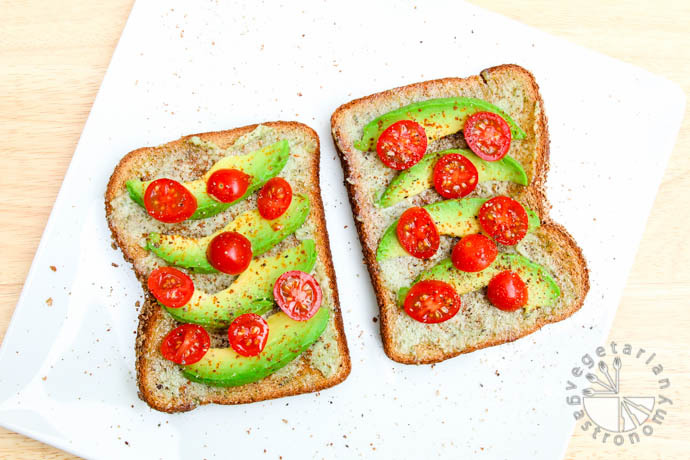 A creamy garlic spread, avocado, cherry tomatoes, and a sriracha salt! 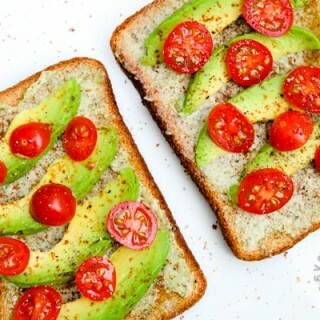 It's a quick and easy breakfast or lunch! Thinly slice half an avocado lengthwise into small sections. Using your knife, pry each slice out. It should slide out from the core pretty easily. After you have each slice, peel the skin off before using. Slice each cherry tomato in half. Toast both slices of bread. Immediately spread a thin layer of your favorite spread on both slices of warm crunchy toast. I prefer to apply the spread while the toast is still warm so that the spread is somewhat melted. 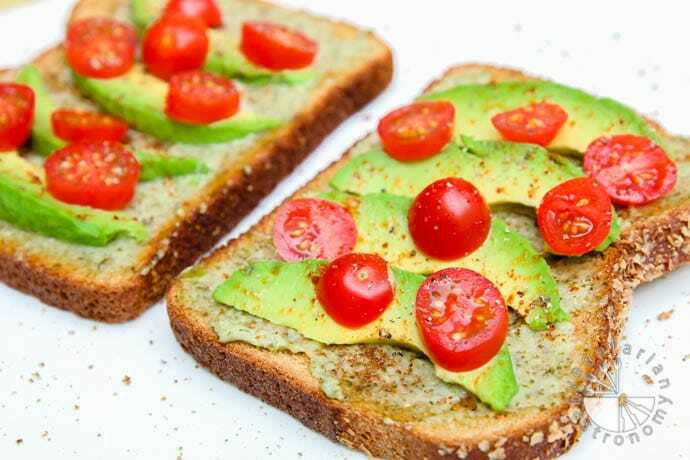 Arrange each slice of avocado on top of the crunchy toast. 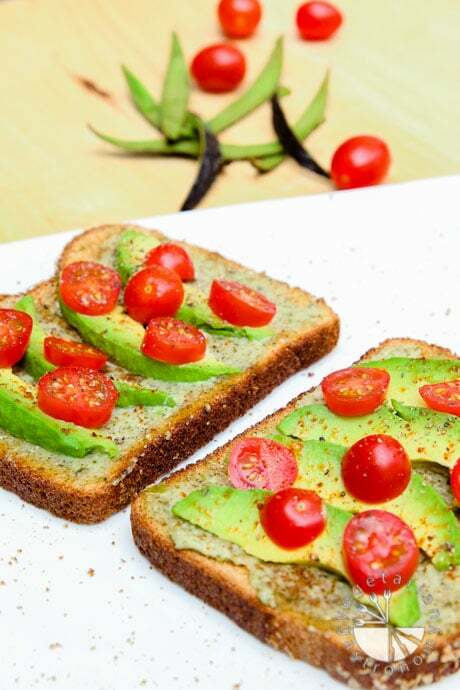 Arrange the cherry tomato halves on top of the slices of avocado. Sprinkle Sriracha Salt or sea salt and freshly ground black pepper. Enjoy! If you don't have Sriracha Salt already made in your fridge (which I highly recommend), you can substitute it for sea salt. If you want that extra spicy kick, feel free to top it off with red pepper flakes or a few drops of Sriracha Sauce. Bread - I prefer sprouted rye or any multi-grain. For gluten-free, use your favorite gluten-free bread. 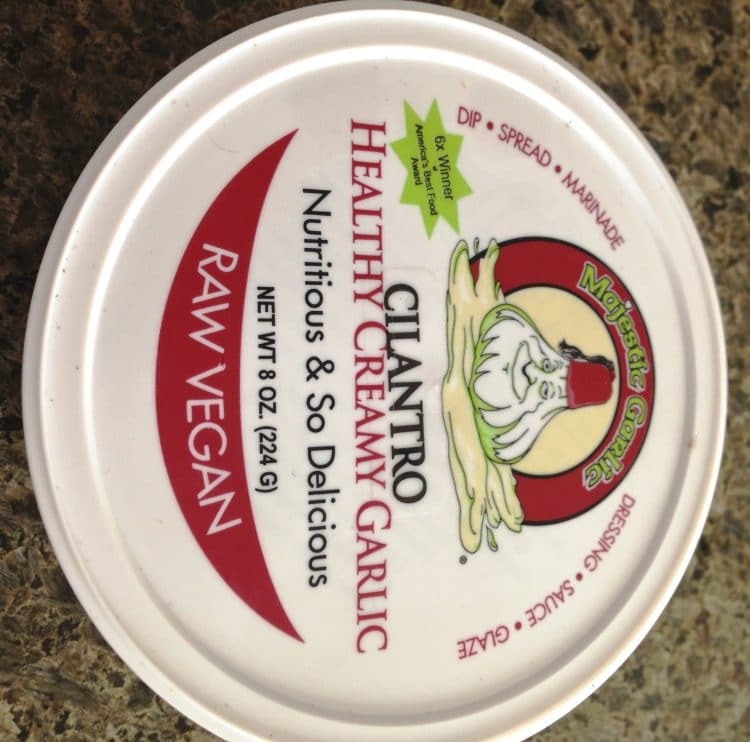 Spread - my favorite is Healthy Creamy Garlic Spread by Raw Vegan, or veganaise, hummus, garlic spread, etc. Thanks! It is delicious! And so quick to make...I absolutely love the Sriracha Salt aspect, although it tastes great with sea salt as well. Thanks for visiting my site and thanks for the comment! Hopefully you get a chance to try out some of the recipes! My son recommended this delicious recipe to me after trying it out at your house. Tastes amazing!!! Instead of using the creamy garlic spread, we used vegetable cream cheese spread and put some sandwich seasoning on it with chili powder. For my husband, I put some thinly sliced onions. Thanks for the great recipe! Glad you liked how simple it is! I have another one of these simple toast recipes coming to the blog soon. Thanks for the comment!